Sow seeds; our little garden helpers always approach this with such studied care and attention and they listen attentively when I tell them what they are planting, what they need to do to help the seed grow into a plant and what the plant will look like. Lying on our backs and finding pictures in the clouds. This is great for their imagination and also a fabulous way of getting them to calm down after energetic outdoor play. It also gives me a great insight into how their minds work. Pulling up weeds; If you are regular reader of my blog you will know that I dislike weeding, but having the company of our Little Garden Helpers really livens up a dreary task. We sing songs, hold each others waists and all tug together on really tough weeds, falling backwards in a heap of laughter (usually leaving behind all the roots but having fun regardless). We pick the pretty weeds and put them in water to decorate our kitchen table and stop to eat ice lollies when we just can't be bothered to carry on. Jumping in puddles. If he spots the rain, Garden Boy runs to get his wellies and we all head outside for the sole purpose of jumping in puddles. I need very little encouragement to join in. Creating archaeological excavations for our Little Garden Helpers, then visiting their Wendy House Museum. They love to do what Mummy used to do and take their displays very seriously! Harvesting vegetables and fruit. They are so eager to help pick, carrying their baskets or buckets and filling them up till they can't really carry them. They always sneak a taste of the strawberries and tomatoes (often devouring the strawberries before they make it indoors) and scrabble to have the biggest marrow in their bucket. They also enjoy the search to find things that are ready to harvest and they are so good at finding the ripe tomatoes now that I can leave them to harvest them themselves now, a responsibility that they absolutely love. Searching for Garden Bugs. 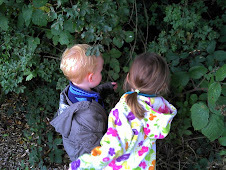 They get so excited when they spot their favourites like butterflies, caterpillars, ladybirds and worms. Garden Boy is particularly good at spotting insects and will insist that everyone comes to have a look his ladybirds (he always refers to them as his!). Digging. Watching them dig is a little pleasure of mine. Garden Girl concentrates on one spot, digging it over carefully, over and over again creating the one perfect spot for growing, all be it big enough for one carrot. Garden Boy on the other hand digs everywhere he can and everywhere he shouldn't. Soil flies over his shoulders and leaves a film on his head and beware anyone digging close by! Cleaning things - the greenhouse, plant pots, potting benches. We get very, very wet but have a lot of giggles and I know cleaning stuff at the end of a season would be a very dull task without the extra bubbles, the water fights, or muddy puddles created by the tipped over buckets of water. Sitting on the patio with a hot drink (coffee for me, hot chocolate for the children) and talking about our day. I should pass this on to 10 more people but instead I will invite you all to join in if you want to. Great post! My little garden helpers love watering (themselves & the plants) and refilling the bird bath & bird feeders. What fun! When I was a kid, I spent hours and hours looking for 4 leaf clovers - I really believed they'd make me luckier. Every so often I'd find a whole patch of them and then it was really time to celebrate! Hi Garden Mum, great posting!..so much to do but with your great Garden Helpers, they are so much fun than doing those chose alone! Great way to spend quality times with yr children too..I can imagine the fun you are having with them!